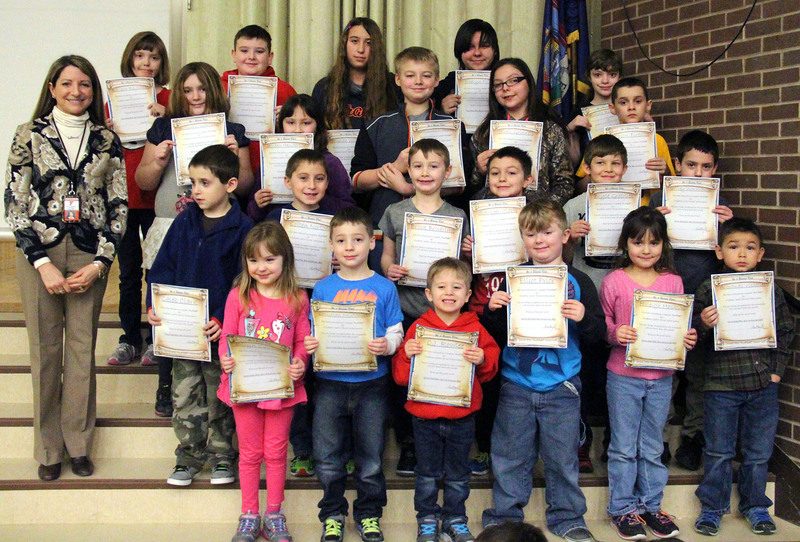 VOLNEY, NY – Volney Elementary School classroom role models were selected by their teachers as students who best represented this month’s character education trait of Tolerance. Volney Elementary School Tolerance Role Models are pictured with Volney Elementary School Principal Lisa Garafola. 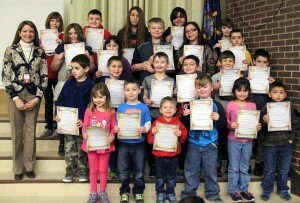 Bryana Stanard, Chase Clark, Austin DiBartolo, Rachael Moon, Kyler DiRenzo, Alan Craig, Hayden Smith, Dominick Vosseller, Hailey Ward, Danielle Boyce, Tyler Sherman, Geena Abbott, Trevor Hendrickson, Kaeli McCarthy, Marissa Bowering, Hanna Miller, Amara Fischel, Eliza Bishop, Abigail Pawlewicz, Collin Wells and Abagail Sheffield. “On-a-Roll” awards were presented to students at Volney Elementary School by Principal Lisa Garafola who is pictured with the January recipients of the award. 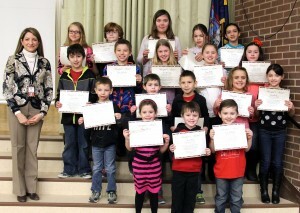 Each student was presented with a certificate to recognize their outstanding behavior for the monthly role model honor. Joslyn Cantine, Christian Mintonye, C.J. Rowlee, Alaina Reynolds, Haleigh Haskins, Elliot Prior, Caleb Clark, Armando Vosseller, Colten Norton, Brock Bowering, Sawyer Clark, Jeff Wardhaugh, Bryce Greenier, Autumn Warring, Jayden Henderson, Jewell Grinnell, Shane Goutermont-Reynolds, Mason Firenze, Kalista Reynolds, Mitchell Donaldson, Jocelyn Polly and Hannah Woodard.